Nassau, Bahamas - The Hon. 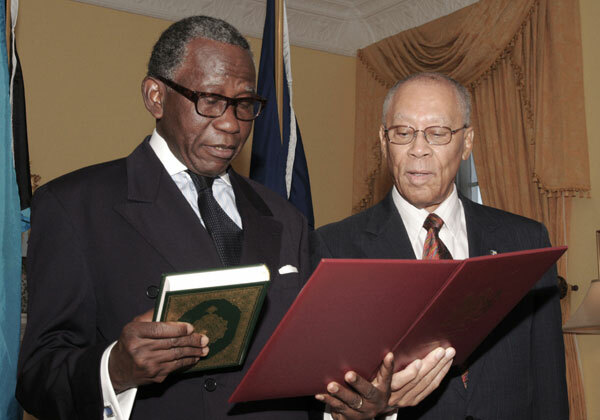 Abdulai Osman Conteh was sworn in as a Justice of the Court of Appeal by Governor-General Sir Arthur Foulkes on Nov. 29, 2010. Justice Conteh, a native of Pepel, Sierra, Leone was born on 5th August, 1945. In January 2000 Justice Conteh was appointed Chief Justice of the Supreme Court of Belize. He was appointed a Justice of Appeal of Cayman Islands Court of Appeal (CICA) in 2008. Justice Conteh is a member of the Bar in both Sierra Leone and The Gambia and he has extensive graduate studies in law, including international law and international organisations and the Law of Treaties including the UN Charter with doctoral thesis focusing on some problems involving use of force by States and UN practice. He has extensive practical knowledge of law and international affairs, diplomacy and business and over 25 years of professional practice of law, both as a private legal practitioner and government lawyer and later as a trial and appellate judge. He has also served several years in academia as a law teacher. A former minister of government, Justice Conteh was responsible for foreign affairs and diplomacy, legal, constitutional, financial and economic issues. Since January 2000 Justice Conteh has been Chief Justice of the Caribbean Commonwealth State of Belize in charge of the Judiciary. He presided in civil, criminal, constitutional, administrative, commercial and environmental cases. He has extensive trial and appellate experience. In 2008 he was appointed a Justice of Appeal of the Cayman Islands Court of Appeal (CICA). He is a former chairman of the Belize Judicial and Legal Services Commission that is responsible for the appointment of Judges, Magistrates and Registrars and officers in the Court Registry and their promotion and discipline. He is s a former member of the Board of Trustees of the Caribbean Court of Justice, a former private legal practitioner in The Gambia and acted as consultant to the Government of The Gambia on the Law of Evidence, resulting in the Evidence Act 1994 of The Gambia.